Do you struggle to make sales? 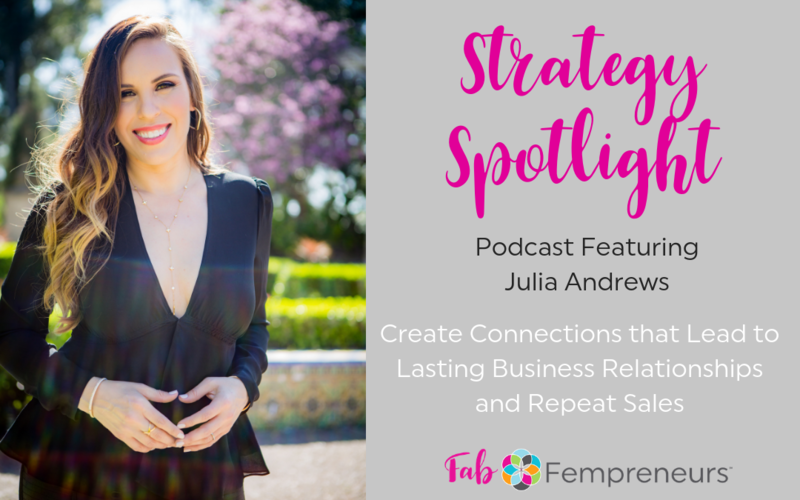 In this episode of the Fab Fempreneurs podcast show, we feature Julia Andrews of Connect2Close who explains how to use filtering questions as a strategy to increase your closing rate and insure that you are discovering and helping your best fit client. You may think that answering objections is the key to success in sales, but if you don’t know how to meet the client’s needs before-hand, your sales strategy could use some help on how to connect, and then close. 2) Discover the 80/20 rule for active listening to present the right solution for your prospect and show them you care. 3) Example filtering questions you can ask your clients to eliminate potential clients that don’t fit, and to find your best client. You can grab Julia’s free ebook here.